Drs. 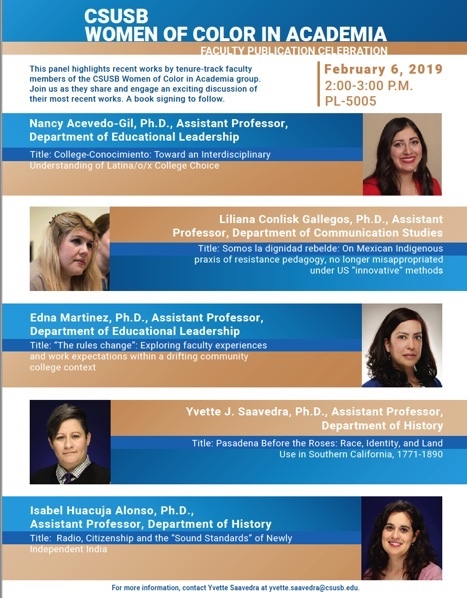 Yvette Saavedra and Isabel Huacuja Alsonso, Assistant Professors in the Department of History will be presenting their recent works on Feb 6th, 2019 at 2 -3 p.m. in PL-5005 as part of the CSUSB Women of Color in Academia panel. Dr. Saavedra will be presenting her recent book publication entitlted, Pasadena Before the Roses: Race, Identity and Land Use in Southern California, 1771-1890. Dr. Huacuja Alonsos will be discussing her work, "Radio, Citizenship and the 'Sound Standards' of Newly Independent India." For more information contact Dr. Saavedra at yvette.saavedra@csusb.edu.